The things that make kids’ rooms so much fun – crayons, games, puzzles, dollhouses, paint-by-number – are also the things that can create such a mess on a daily basis. And often, it seems that a cloud of dust and dirt just follow kids around the house, determined to settle wherever they do. When it comes to creating décor for kids’ rooms, there a few rules to keep in mind that will help make these spaces worry-free and keep their spaces clean and orderly. Many people stay away from upholstered furniture in children’s rooms, fearing the inevitable stains and spills. Interior designer Kate Jackson charged into the third floor girls’ bedroom and playroom of the Perspective New England Beach House, determined to use Sunbrella fabrics in a beautiful color palette that would grow with the girls. Kate, like many designers, recognizes how cleanable and durable Sunbrella fabrics can turn kids’ fun décor dreams into a reality. 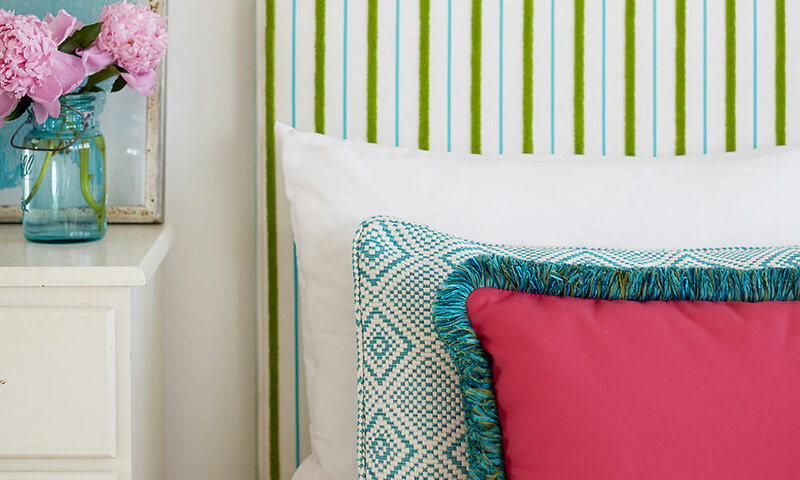 From upholstered headboards to window seats and a sectional, Kate used durable Sunbrella fabrics to add personality to every part of the room. Other unique ways to incorporate upholstery into your kids’ room include rocking chairs, storage ottomans and comfortable chairs for endless hours of reading. Childhood forts, jumping on the bed and general silliness are all a part of being a kid. Make sure your little ones are well cushioned by decorating their room with lots of soft, sumptuous items. From decorative Sunbrella throws to bed and even floor pillows, soft items add comfort, cushion and a cozy place to land with a good book, watch a movie or share secrets with a friend. A soft rug for their bedroom floor serves as a comfortable play mat and helps define the room. Bumps, marks and the occasional marker or finger paints are bound to find their way to the walls of your kids’ rooms, so be proactive when it comes to painting. Use washable no-VOC paints for easy clean up. Semi and high-gloss paints are easier to clean, but an entire wall of them can be overwhelming. Paint the lower half of the wall a shade or two darker than the top half to make those messy streaks from busy hands easy to clean. The color variation also adds depth to the room. Rather than spending time and money searching for prints, paintings or other artwork for the children’s room, find inspiration in the artwork they create every day. Create a kids wall art display by stringing wire from wall to wall in the room and hanging their best creations with clips or ribbon. Another kids wall art idea is to display a gallery of their work in clear acrylic frames that can easily be switched out once the next masterpiece appears. There’s no shame in wanting your children’s room to be as clean and tidy as it is stylish. Durable and functional kids’ storage solutions provide the best chance of making this happen, including Sunbrella storage baskets from Colonial Mills like the ones designer Kate Jackson used throughout the Beach House third floor kids’ room. Roomy and easy to clean, the baskets fit well on bookcases, at the foot of the bed or anywhere they need to be. What does worry-free children’s décor mean to you? Share your ideas in the comments section below.